Recently, BMW held the global debuts of two exciting new models at the 2018 North American International Auto Show in Detroit, Michigan. It’s anticipated that both models will be available to customers in the spring, and prices will be announced prior to each vehicle’s release. The 2018 BMW X2 SUV boasts a sporty exterior and new twist on the familiar kidney-shaped grille. Featuring a 2.0-liter TwinPower turbo 4-cylinder engine that comes married to an 8-speed automatic transmission, the BMW X2 makes 228 horsepower and 258 pound-feet of torque and includes all-wheel drive as a standard feature. The two-door 2019 BMW i8 Coupe is capable of seating four comfortably. The plug-in hybrid delivers a greater all-electric driving range than ever, covering 18 miles — marking a 30 percent increase when compared to the current model’s range. The 2019 BMW i8 Coupe generates 369 horsepower and has a top speed of a law-shattering 155 mph, and is capable of going from 0 to 60 mph in just 4.2 seconds. 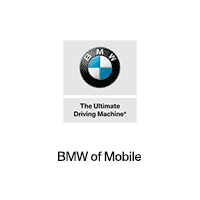 At BMW of Mobile, we’re proud to serve BMW drivers from the New Orleans, Saraland, Fairhope and Daphne areas.